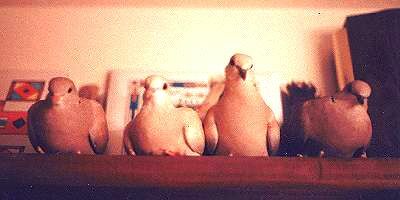 I have eight ring-necked doves as pets - Suzie and Timmy, my original mated pair, and their offspring - Perry, Sally, Luna, Dusty, Lily and Camille. My good friend Rich gave Timmy and Suzie, in October of 1995. Neither of us knew at the time Suzie was very sick with a respiratory ailment and almost didn't survive. I put the doves in a spacious cage in my living room, and the cats, Spooky and Eunice, took a real interest in them, watching them incessantly for several days. 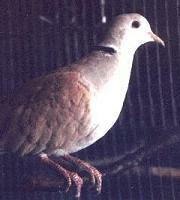 After that, they kind of lost interest in the doves and never showed the slightest aggression towards them, even when I let the doves out of the cage for exercise. Doves are natural browsers, walking along the ground searching for their food, and they love strolling around the house picking crumbs out of the carpet. 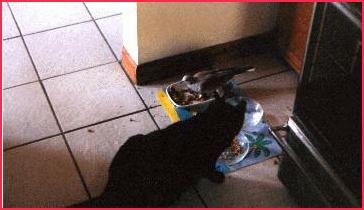 The doves quickly zeroed in on the cats' food dishes and gleefully gorged themselves with the catfood, much to the confusion of the cat (see left). It wasn't long before the doves began laying eggs. They usually lay eggs in pairs, two days apart. They take great care with their eggs, even sitting on them in shifts. Timmy sat on the eggs from dawn to dusk, and Suzie always sat on the eggs overnight. After about two weeks, the eggs hatched, again two days apart. 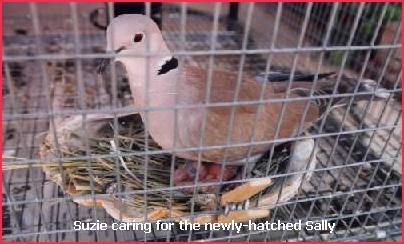 The baby doves are featherless and blind at birth. They grow at a phenomenal rate after hatching; two days later, they have already tripled in size. In fact, right after they are hatched it seems impossible they fit into the tiny egg. I would estimate that in the past six years, Timmy and Suzie have laid well over 100 eggs, and they continue to "be fruitful and multiply" to this day. Timmy and Suzie are excellent parents, doting on their babies and spending all of their time caring for them. Timmy works just as hard as Suzie in this. They feed them regurgitated food, the baby sticking its beak down the parent bird's throat. Each baby gets as much as they want to eat. In fact, when Sally was born by herself (the other egg was not fertile) she was studiously fed by both parents, and got so fat she could barely move. After several weeks the babies venture out of the nest and explore the rest of the cage. The parents still spend a lot of time with their offspring, and several times I have seen Timmy teaching the young birds how to eat sunflower seeds from their food dish. 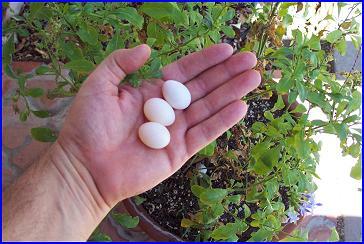 I have tried to hand-tame the baby doves as soon as I can after hatching, with various degrees of success. Sally was my tamest for a long time, loving to be handled and having her head scratched. She is very sweet-natured and definitely one of my favorites. Perry and Marty have grown up to be the "Party Boys" and were quite rowdy and rambunctious, although Perry has calmed down considerably since I adopted out Marty and moved little girl Dusty into Perry's cage (they have bonded and are laying eggs). Lily was born last year and from the very start she was exceptionally tame and easy to handle. She has eventually evolved to be a free-ranging bird in the house. 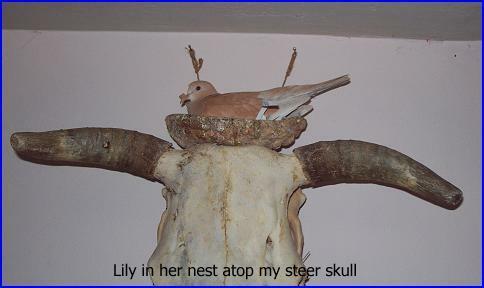 She spends most of her time in her nest atop the steer skull, as you can see, but she does have freedom to fly in the house. She is very affectionate to me, often flying to me and landing on my shoulder or on top of my head, her favorite spot. Extremely curious, she loves to inspect everything that you are doing. In answer to everyone's question, yes she does sometimes leave little droppings around the place, but it is very infrequent and very easy to clean up. 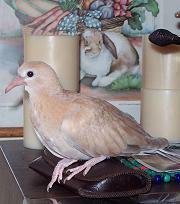 I really enjoy having the doves as pets. They are such sweet, gentle creatures and always a joy to watch. It's really amusing when I put a bowl of water in their cage for bathing; they get all excited and flap their wings, spewing water everywhere. They are inexpensive to feed, eating mostly wild bird seed, which you can buy cheaply, and their diet is supplemented with parakeet seed, and bread. Also crushed oyster shell for calcium. Quite often when I am talking on the telephone, the doves think I am talking to them and will start a loud chorus of coos, prompting the person on the other end of the phone to ask if I live in a jungle. What can I say, I always answer 'yes'. 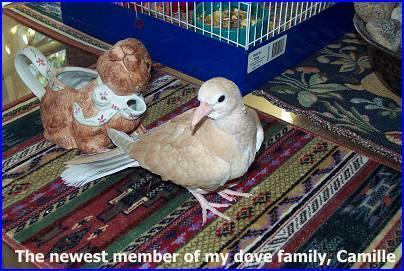 I love to share my doves and have occasionally given some away to people who I am sure will provide a good, loving home for them, but I prefer to keep them. Their cooing starts every day at dawn, and sometimes they can get pretty loud, but they are wonderful, fascinating companion animals, and I wouldn't trade them for anything.